A weld broke on one of the rear stabilizers (what a surprise) as I was heading out of the Burros. I really need to get a more practical trailer for this lifestyle, maybe a 18 footer with aluminum framing, insulation(what a treat that would be!) and decent ground clearance (not just another 2”). When I got to the first spot up rt180 where I wanted to camp, there was no one around. Yes! But. The next morning I hiked ten minutes up the road to the trailhead where I was going to start my run. That’s where I saw this sign. Guano. I hiked down another road on the way back to my camping spot and it took me down to a water holding tank. I was making a lot of noise coming down a loose rocky section and spooked a bear. It looked as if she might have been taking a bath in the small tank. The water in the tank was still in motion and the ground next to the tank in one spot was soaked. Along the path the bear took, there was less and less water until there was practically none after 50 yards or so. As if the bear came out of the tank thoroughly wet and the water was dropping off as she ran along. This, almost, made up for the lost trail run. I came here specifically for the trails so I figured to pull out in the morning and continued up rt180. This was not meant to be. That evening I packed up and was all set to get an early start. This is where the ‘not meant to be’ comes in. The other day in Silver was pretty rough on M&M. It was hot and I had a lot of errands to run. Apparently Meadow remembered what it was like the last time she was in the truck and when she picked up on my getting ready to leaveshe ran off. It was 2:00 before she jumped up on the spare wheel and meowed to be let into the casita, too late for me to go looking for another place to camp. I had rolled the awning back out and unpacked and set up the window cage. It was too hot for me to spend time in the casita and the bugs were somewhat unpleasant when trying to do stuff outside. It was not a good day. I can’t blame her since she might have had the worst day of her life back in Silver but at times during the day I was contemplating wringing her neck. I didn’t let her out the rest of the day nor in the morning. I chanced letting Mesa out in the morning and thankfully he soon came back in and we got an early start. North of Glenwood, I turned onto a gated forest road looking for a new place to camp. No go. The road got pretty rough and the tongue jack was dragging a few times (it has not been round for a couple years now). I finally found a place to turn around but with the Dodge’s wheelbase, it took quite a bit of maneuvering. Another 20 miles or so up rt180, I turned off on another forest road. Not bad. It forked and I took a left. I was not liking the terrain so I came back down and took the other fork. A fire had been through but most of the ponderosa were still standing and except on the lower branches, had green needles. There was quite a bit of ash in the soil and oh man, did M&M get dirty! That took extra water. The spot was pretty open but there was some shade and miles of dirt roads for mountain biking. Only 4 vehicles drove by during the two weeks we were there. I had plenty of water but the collapsible water container I use to refill the sun shower bag sprung a leak so I lost a couple gallons. There were a number of elk in the area. It was good to hear them again and to catch glimpses of them through the trees. I’ve been having some nice scenery lately while driving along on the asphalt. Most RVers seem to be quite content with this. I’ve talked with people who have driven up to Alaska and many do it because Alaska is near the top of the ‘sights to see’ lists. They drive hundreds of miles a day, day after day to get up there. Then drive around Alaska for a couple weeks and head back south. Granted that they see absolutely stellar scenery but someone would have to hold a gun to my head to do that. I can’t see myself going to Alaska but if I did, with the way I travel, it would take me months just to get up there. That would entail leaving the rig up there for the winter; then travel around Alaska the next summer; store the rig up there for another winter; and spend the third summer traveling back to the states. Don’t think so. My favorite traveling is along single tracks in the mountains. Preferably running the trails (if it’s one of my strong months) just before sunrise. If not running, then hiking or mountain biking. I need to be more in touch with ‘traveling’. It needs to be a physical endeavor. I get a charge out of this body’s ability to move along at a decent pace while taking in the scents and sounds, the sights and the wildlife. There’s a sense of fulfillment in the simple pleasure that comes from physical activity. It’s one of the reasons I try to stay in decent shape. I do not want to be huffing and puffing and have to stop to rest as I travel the single tracks. That would definitely put a big damper on the experience. Been there, done that, didn’t like it. Different strokes. I don’t think I’ve ever pulled over at a scenic overlook to look around. It’s almost like I didn’t earn the view. Besides, the best sights are definitely not seen from the asphalt. Emily gave me a heads-up about the ‘travel management’ program that the forest service is putting into effect. It has been put on hold in the Gila’s due to the fires so I have not run into it yet. All because of the damn porker carts. It is one of those instances where a relative few ruin things for the many. I was talking with a ranger who stopped by to make sure I knew about the fire restrictions. We had a great conversation as we got off on other topics. Something new I had not heard about was how some people are using their camping spot. Rangers are coming across people out in the national forests cooking up methamphetamine. Guano. I asked if one can smell it if they get close enough and the ranger said it depends how they are cooking it. He generally picks up on the situation by looking at the ‘camper’s’ pupils and the fact that they are WAY hyper. Sometimes they are not even in an RV using the galley but just tent camping and using a camp stove. I wonder if the fire restrictions this summer will have them looking for other places to set up rather than out in the national forests. But then again, these are not the most law abiding citizens we have in our society. I thoroughly enjoy my Gary Fisher Wahoo mountain bike. But, I really like the looks of a two-niner from the first time I saw one a couple years ago. The price of mountain bikes with 29” tires has really dropped over the last few years so I bought a Trek Marlin while in Silver. Besides, I like to give whatever business I can to Gila Hike and Bike; they are good people. You can see how the standard 26” tires compare to 29” (same size frame). I find the 29” wheels more forgiving when maneuvering through rough spots. I just wish the two-niner was lighter. Now I just have to sell the Wahoo. The Marlin was a totally needless expense but I sold a number of things while down in Bisbee so I more or less got the bike for free. Yeah, right. After we broke camp one morning, I checked out two other forest roads for possible camping spots further along rt180 for the next time I come through here. As always, I marked them down in my road notebook, noting mile markers so they’ll be easy to find and making for a safer turn if there is traffic. We passed through Alpine and I noticed a laundromat so I stopped rather than look for one in Springerville. The magazine selection was somewhat different. It was early and not many people were around. I had a good talk with a couple who were out for a walk and later with a fireman who told me about last year’s fire. They sure had it rough in Alpine. The library was closed but I accessed the web from the parking lot. There was a thrift shop down the block so I dropped off the 2-burner Coleman stove. I also had my propane tanks and water jugs filled at the tackle shop at the bottom of the hill. What a treat, to be able to take care of all of this in one small town (like Chama). After groceries at the Safeway in Springerville, I headed west along rt260. 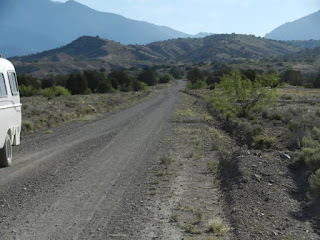 I thought the Fort Apache Indian Reservation was all south of rt260 but found out that was not so as I was driving along a narrow spur road north of the highway and ran into an Apache Wildlife officer. It went well; he set me straight and directed me towards national forest land. Well, I’ll see what these White Mountains are like and hope I don’t come across any rangers or seasonals who keep track of 14-day stays. Cutting down on calories: If you eat something and no one sees you eat it, it has no calories. If you drink a diet soda with a candy bar, the calories in the candy bar are cancelled out by the diet soda. When you eat with someone else, calories don’t count if you eat less than they do. Pieces of cookies contain no calories. This is because the process of breaking causes calorie leakage. Foods that have the same color have the same number of calorie. For example: spinach and pistachio ice cream; mushrooms and white chocolate, etc. There was a series of questions about something in an AARP article. One asked which is better: Getting $100,000 at once or Getting a penny that’s doubled every day for a 31-day month? Since the later sounded so bizarre, I figured it must be the right choice but I had to do the math to see it for myself. Yep, nearly $11 million is better. Very strange.